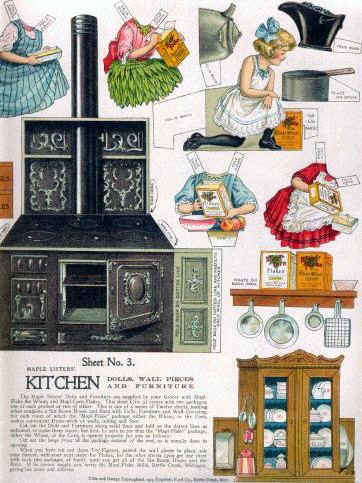 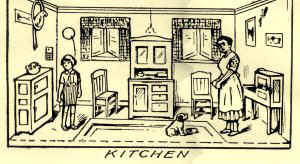 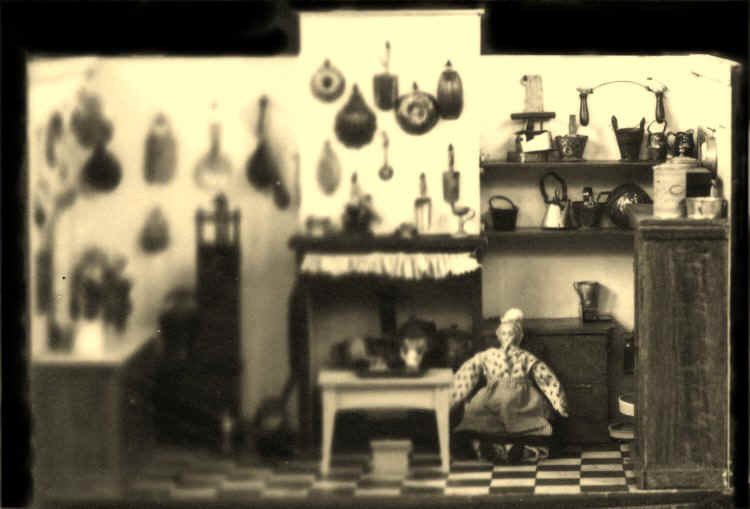 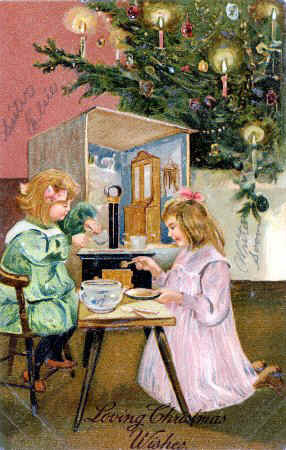 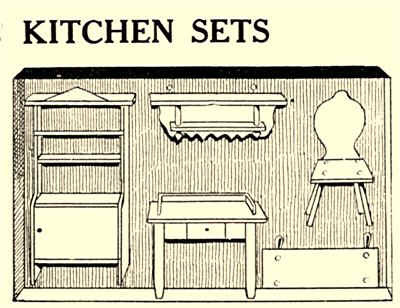 1913 kitchen of Betty's Bungalow, a lithographed cardboard house made in the U.S.A. 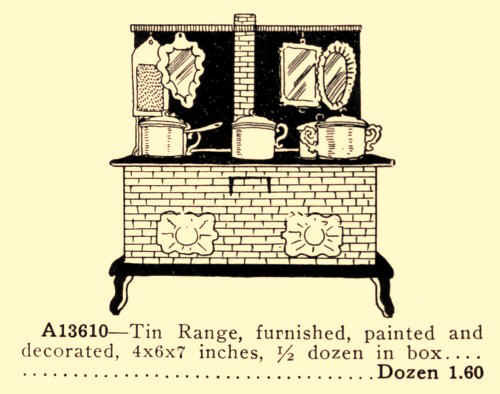 The iron range is set in a wide, exposed red brick chimney, the opening of which is topped by a white painted shelf, supported on a pair of curved wood brackets. 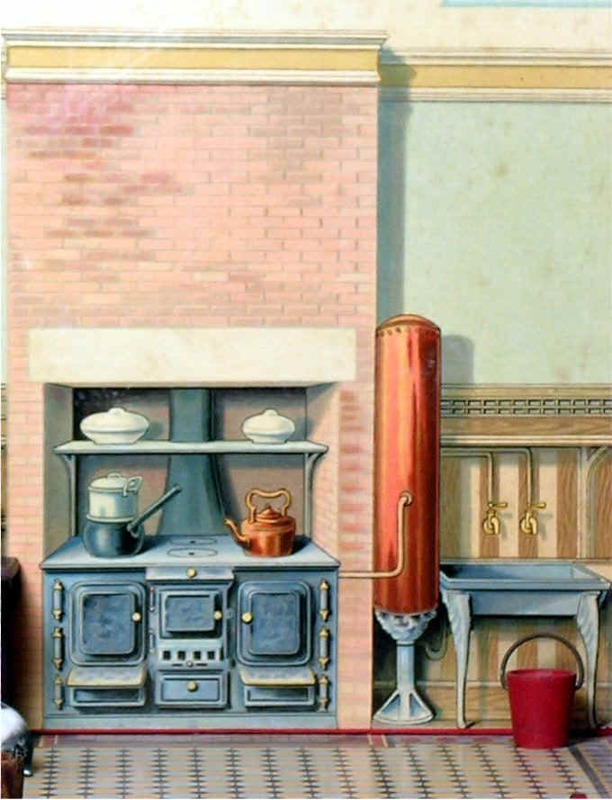 The range has no metal chimney -- probably an oversight (the huge brick chimney rising over the roof indicates the use of coal or wood rather than gas). 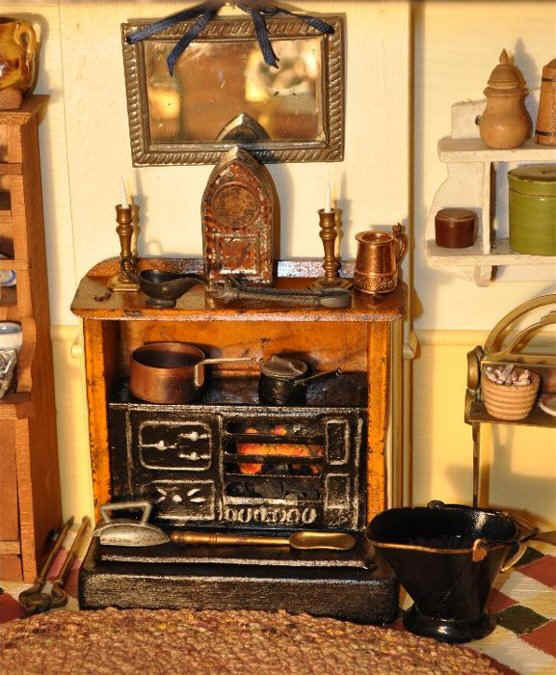 A brick hearth protects the floor area immediately in front of the stove. 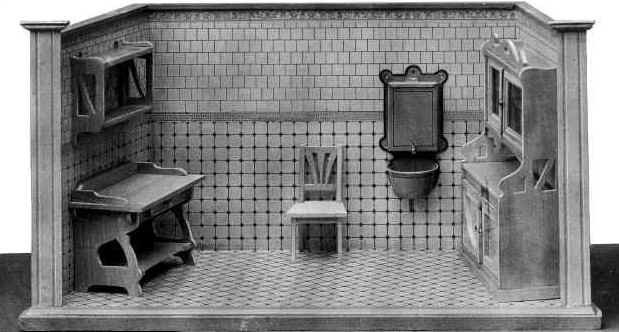 The floor is blue and white tile (or patterned linoleum). 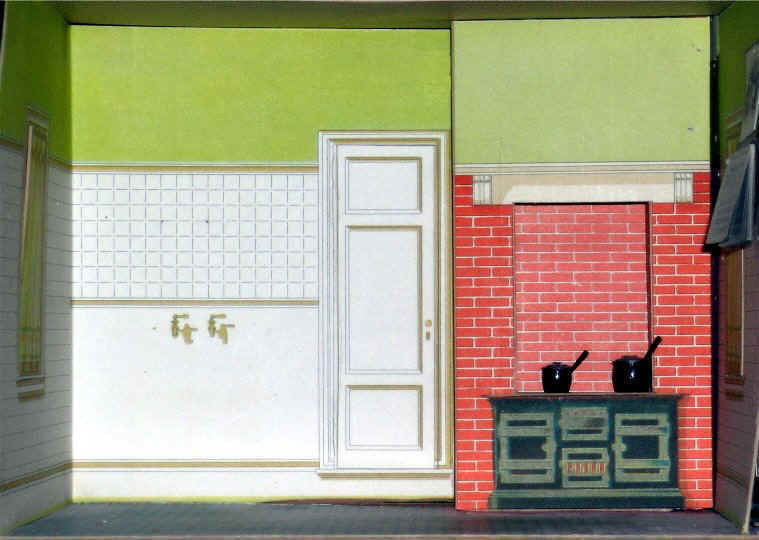 The upper walls are painted green, while the remaining wall area is covered in white tile. 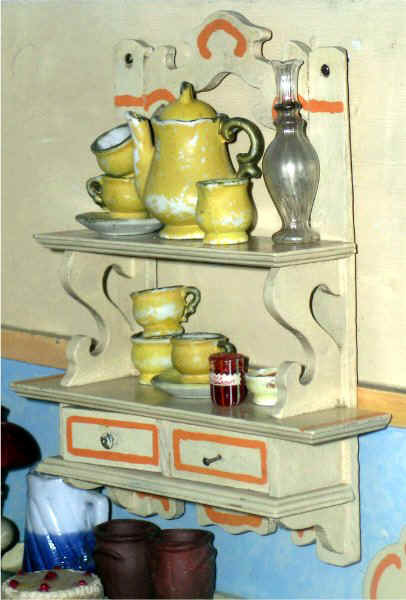 The woodwork is painted white. 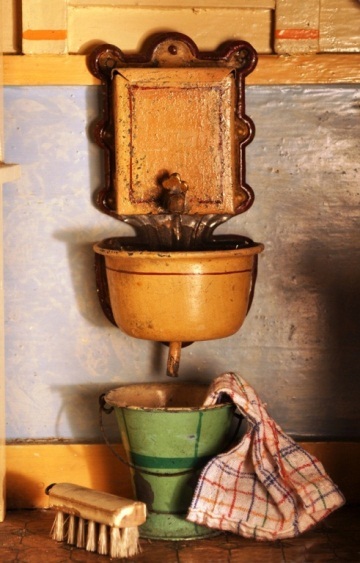 A pair of faucets are positioned on the wall to serve a sink, supported on legs (not in position). 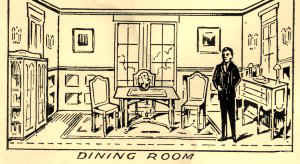 Transparent yellow curtains are hung on the windows. 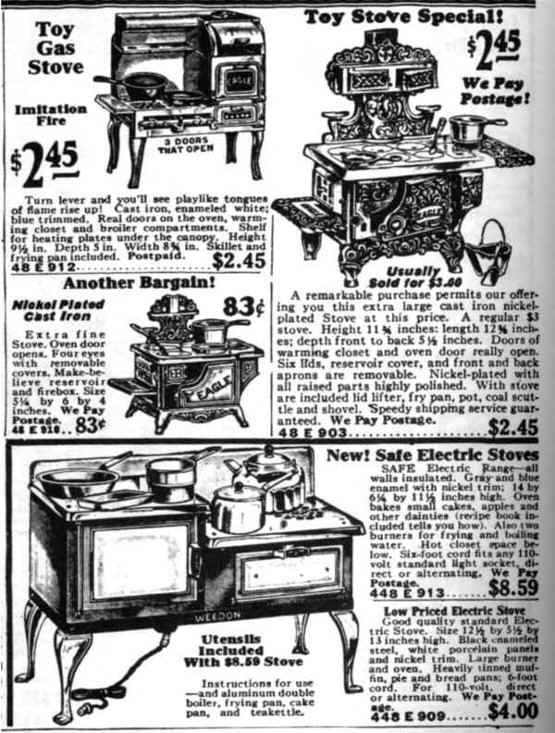 In the meanwhile, many houses -- well into the 1930s -- in Canadian and American villages and in thecountry had iron cook stoves, which used split wood as the fuel. 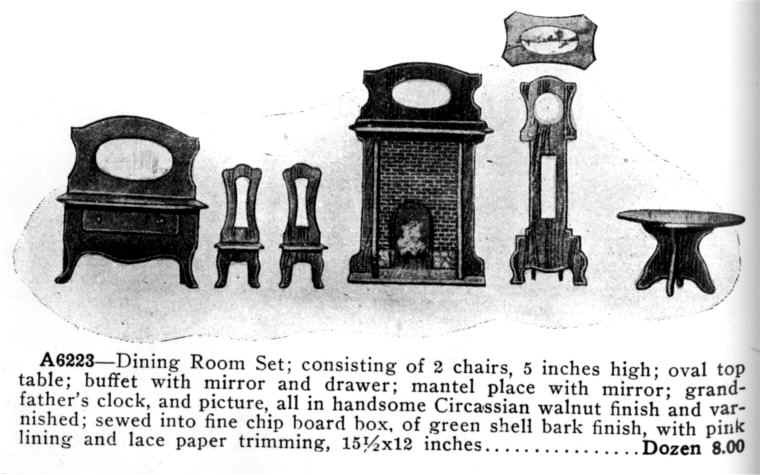 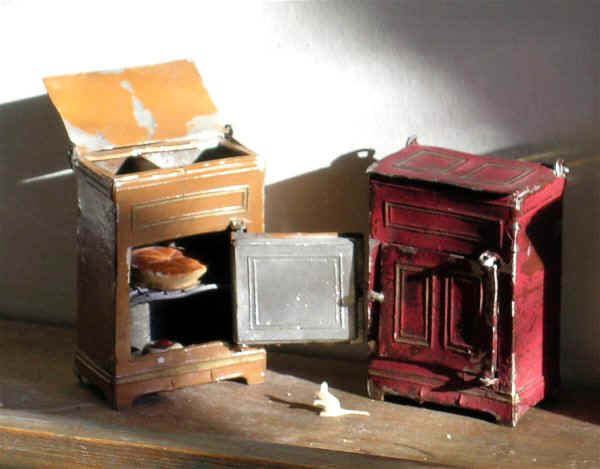 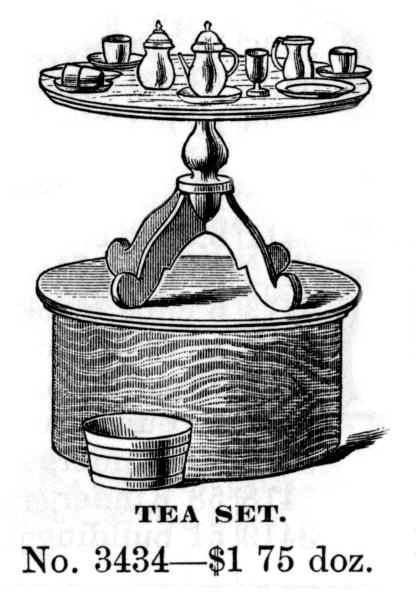 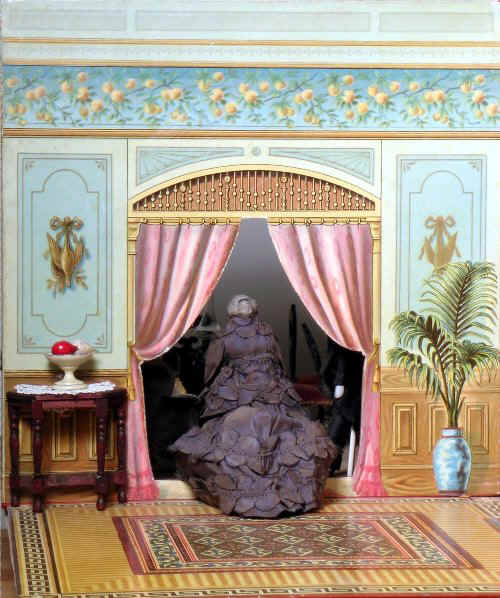 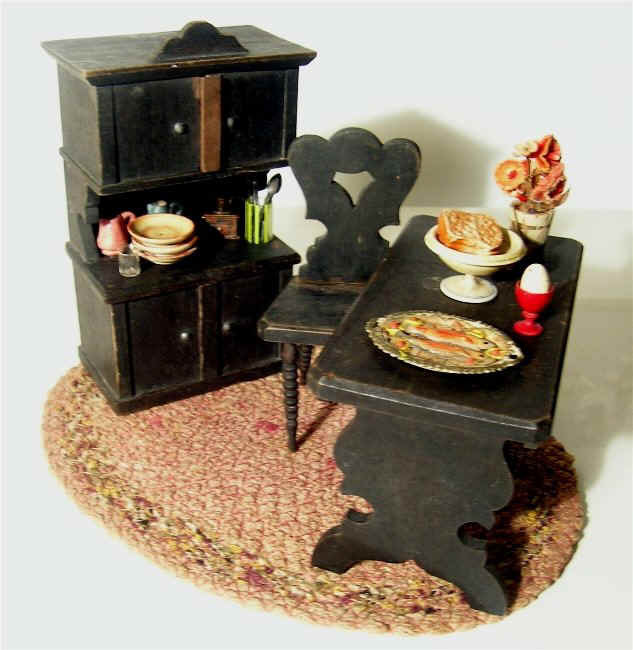 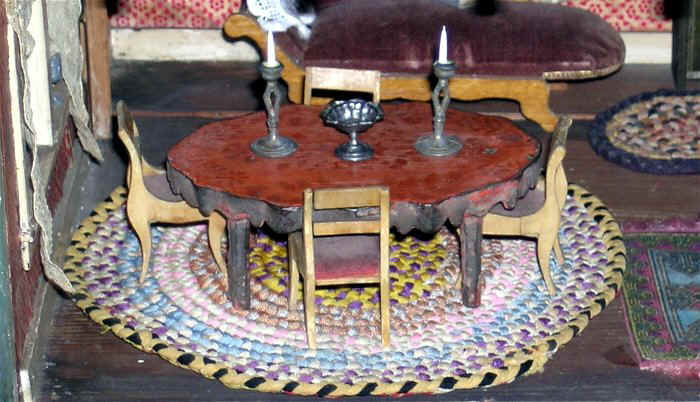 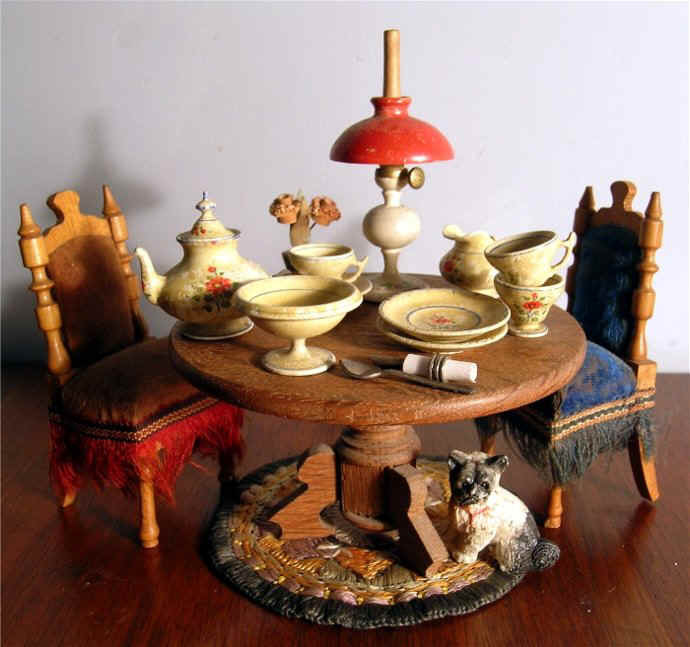 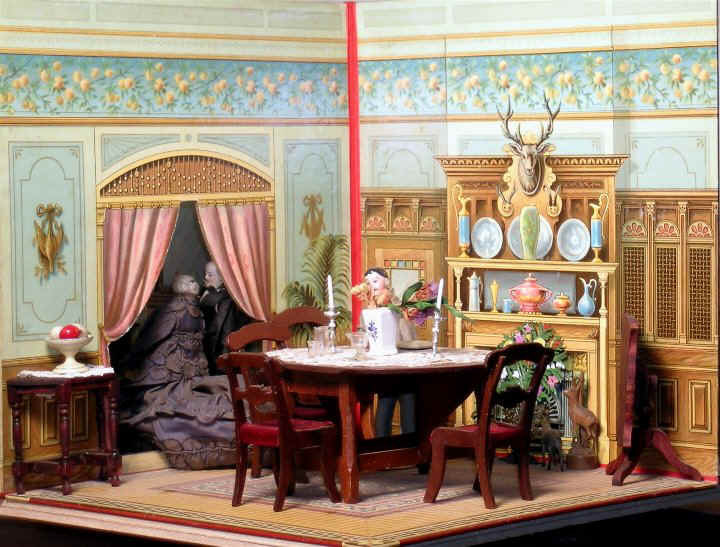 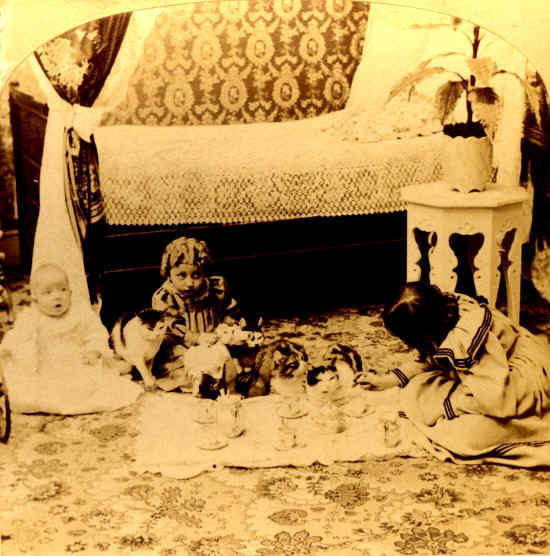 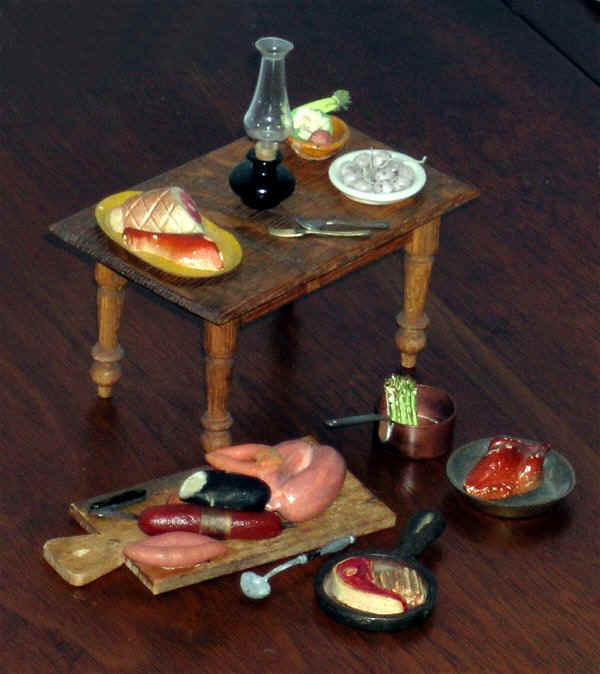 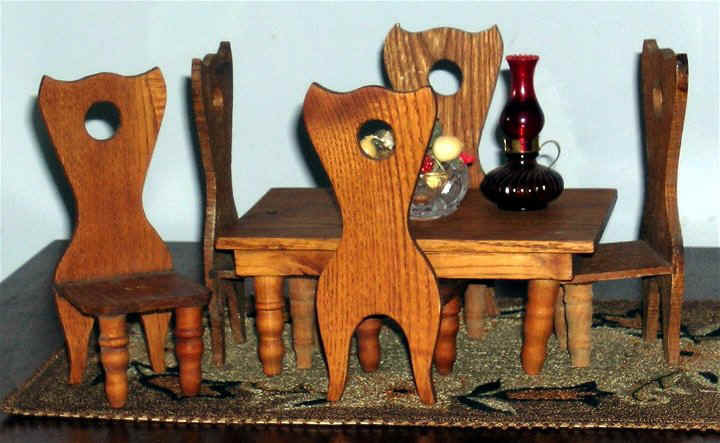 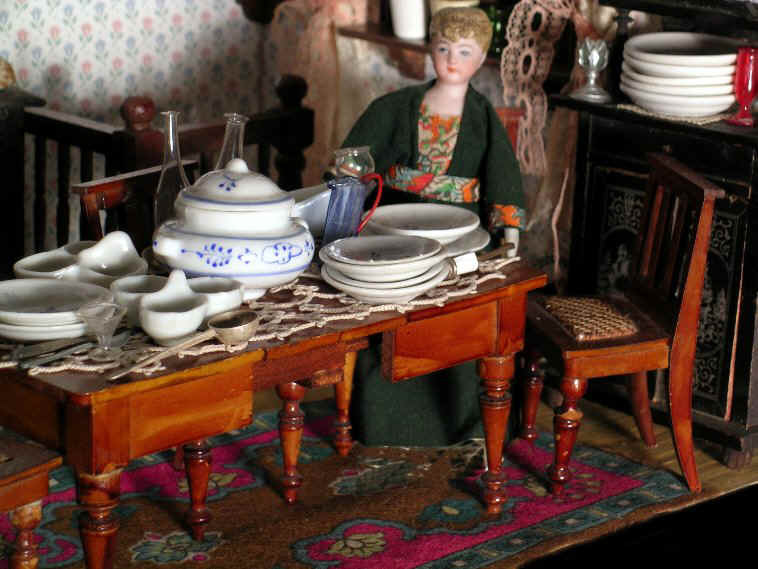 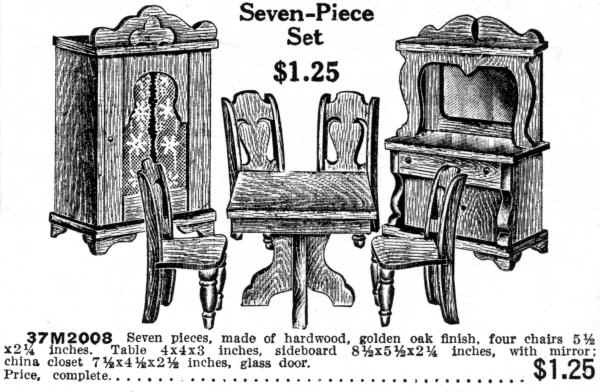 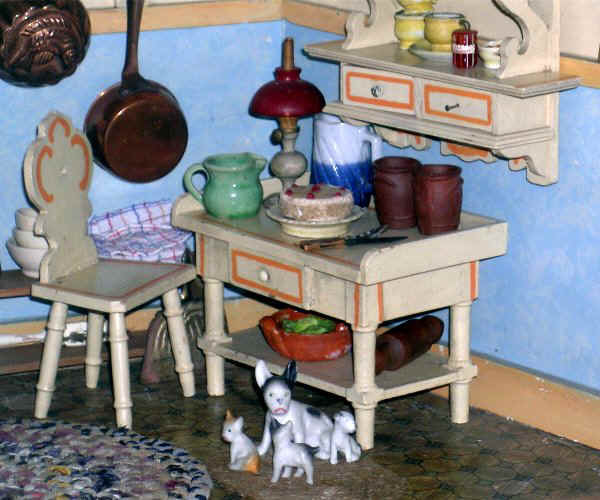 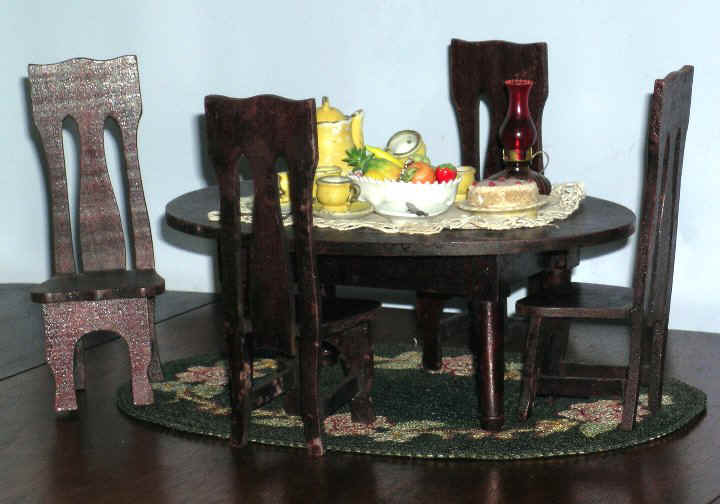 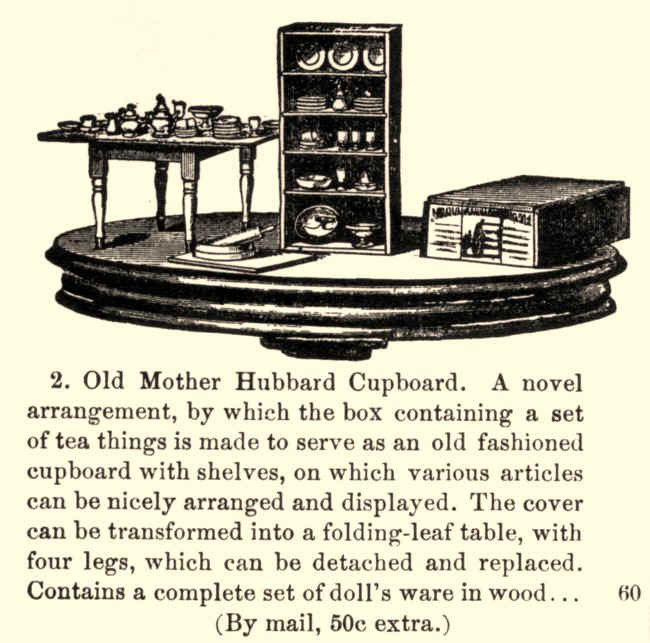 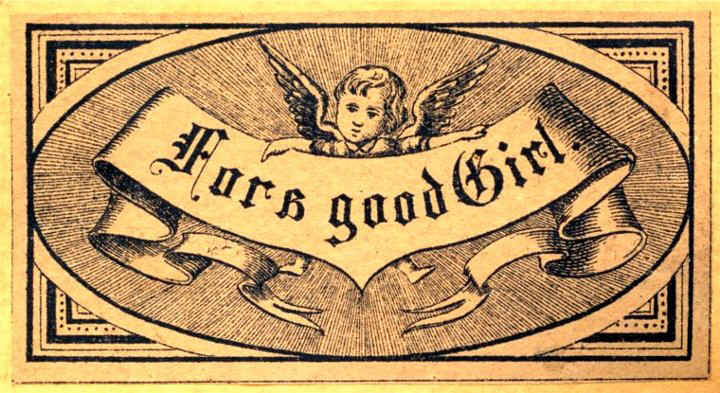 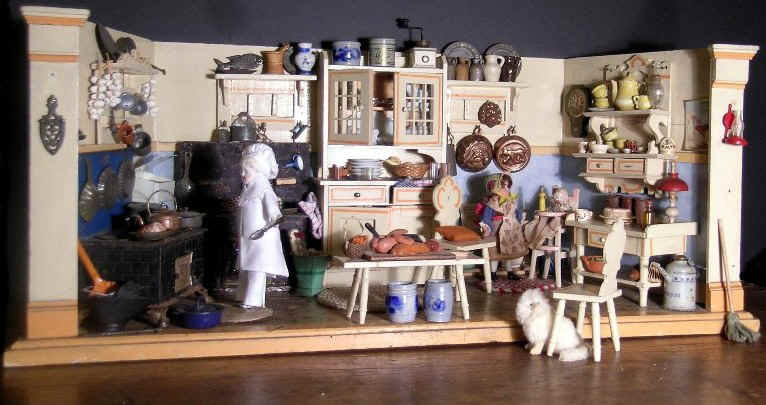 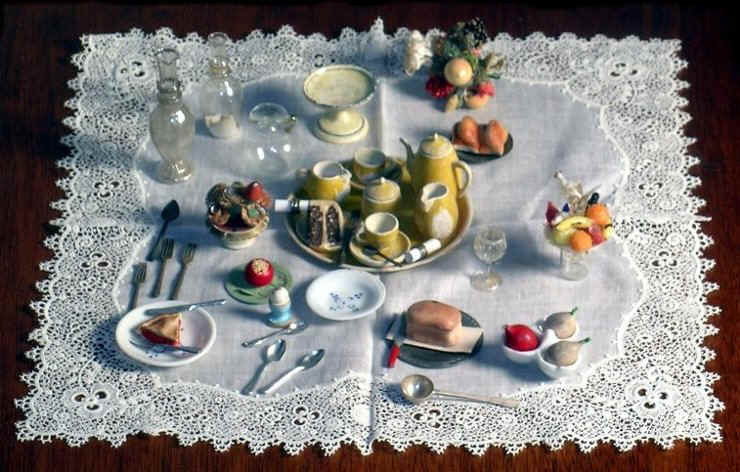 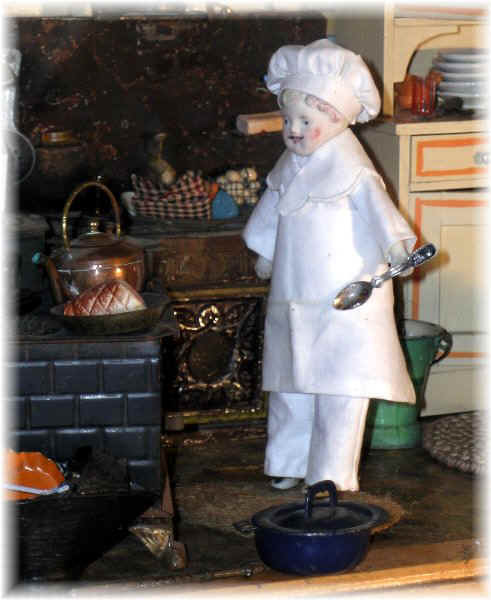 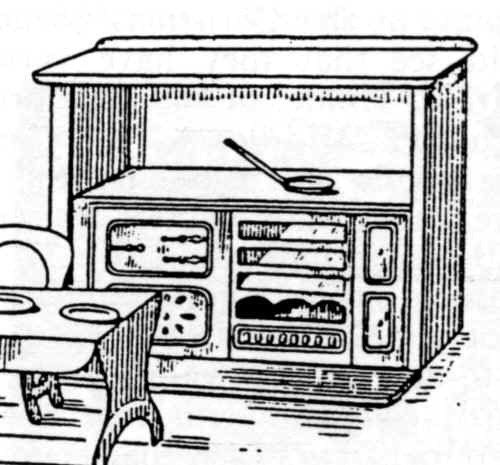 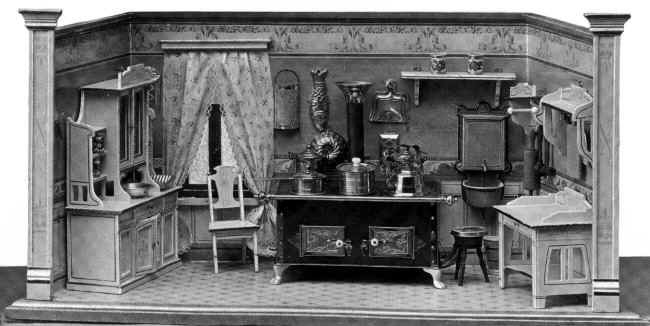 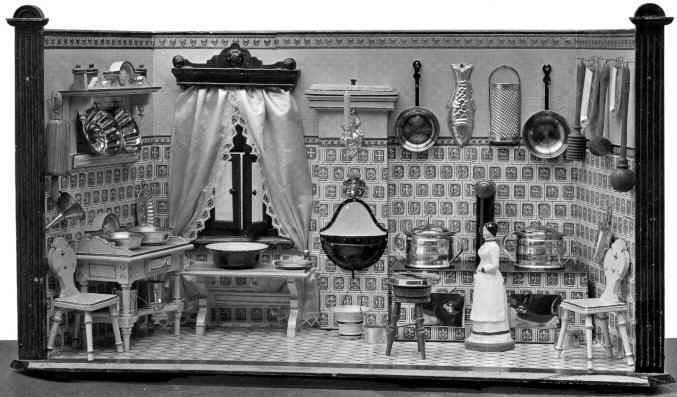 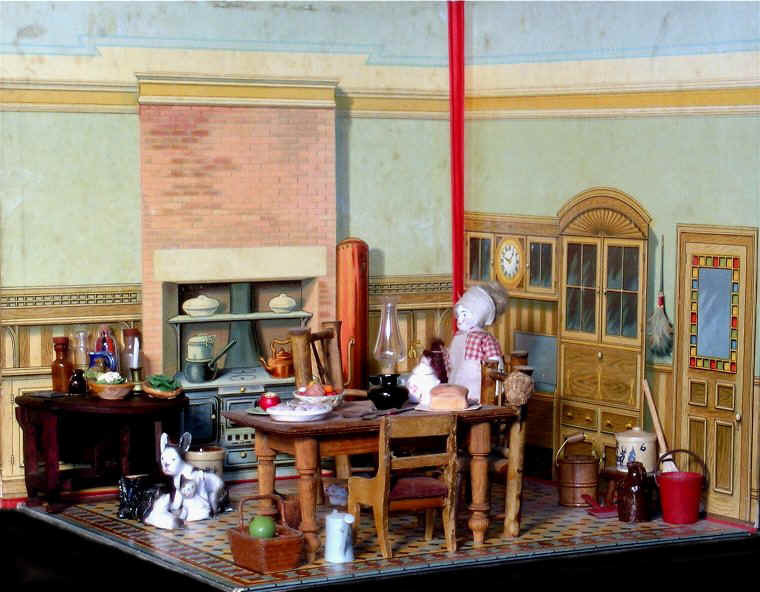 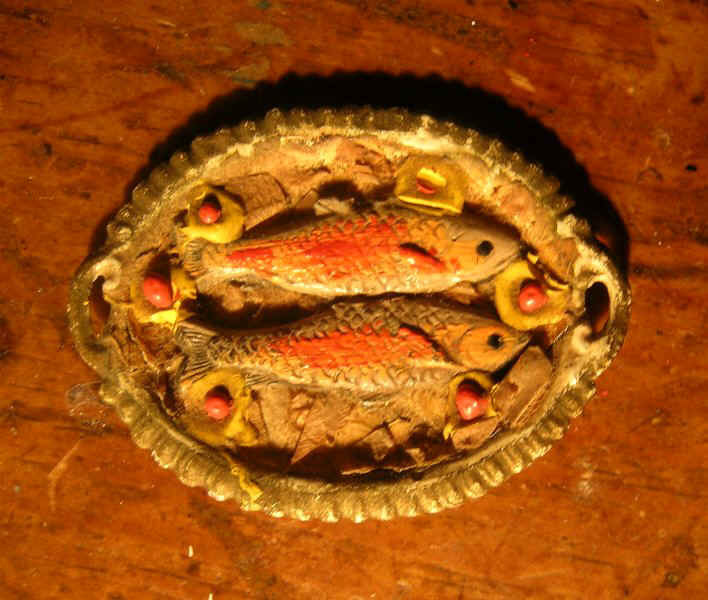 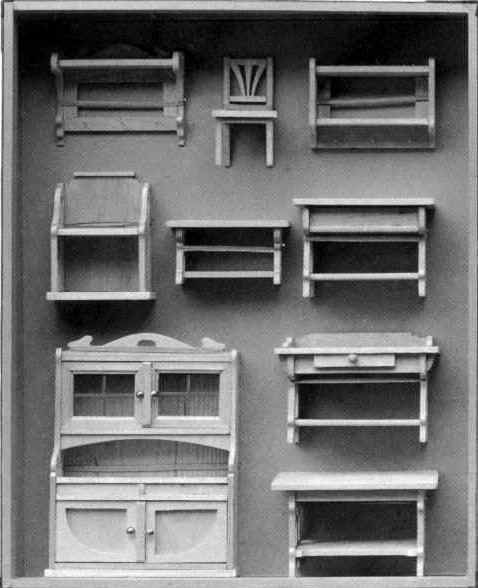 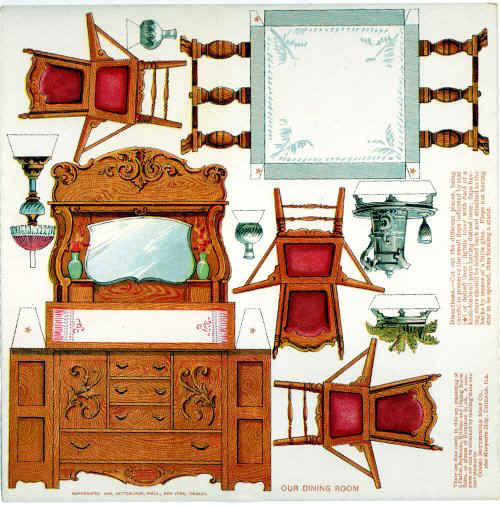 They were offered as an alternative cooking apparatus (to gas and electric stoves) for dollhouses in toy catalogues until about 1930. 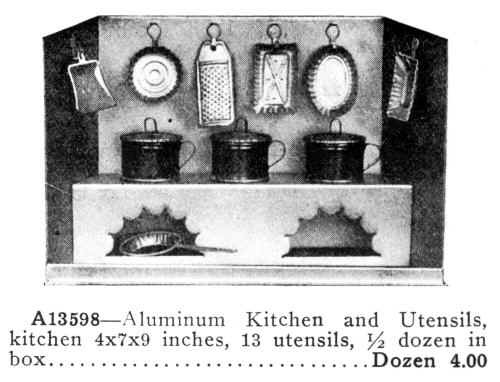 Built-in metal range. 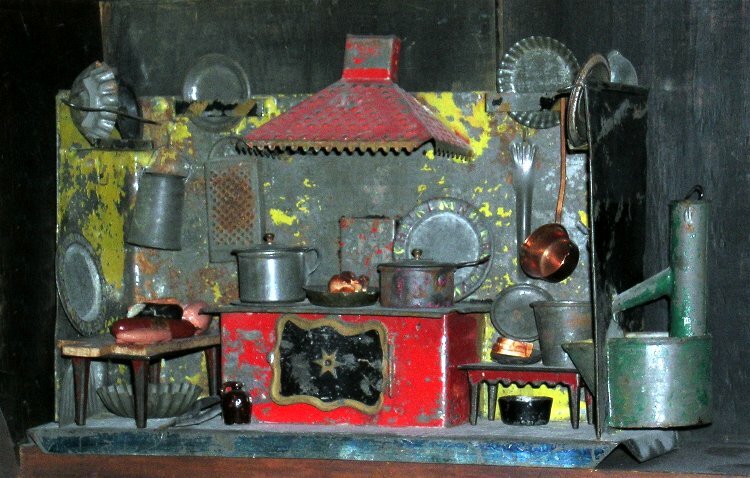 This one was part of a set ("Monster Kitchen Set": stove, dresser, table, chairs, plate & frying pan, all in metal), made in England by Hopkins Bros., Victoria Tin Toy Works, London, and advertised in 1927. 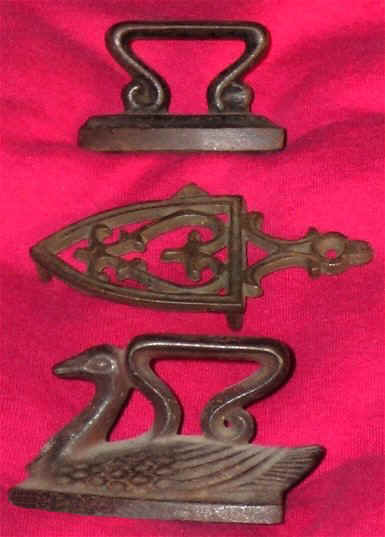 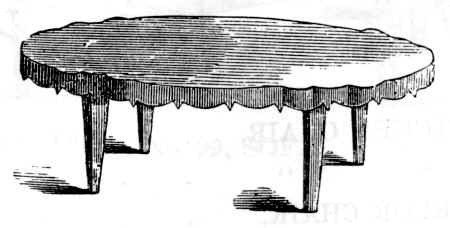 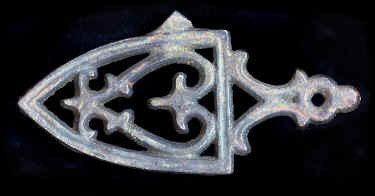 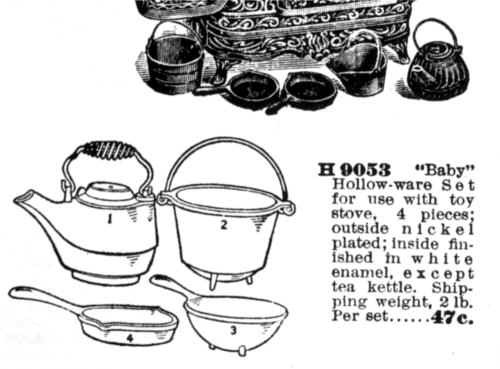 This type of range, however, had been in use for many years previous. 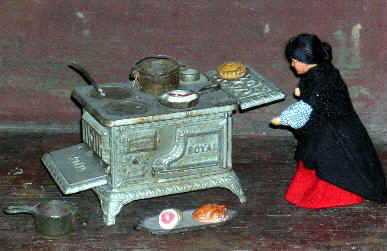 It was more popular at an earlier date in Britain because of the prevalence of coal than in North America. 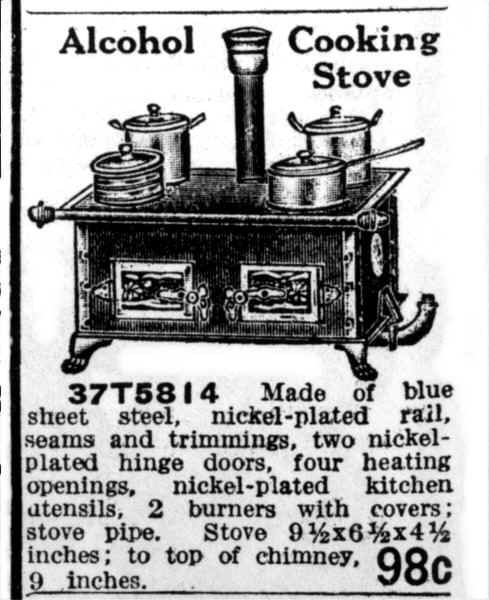 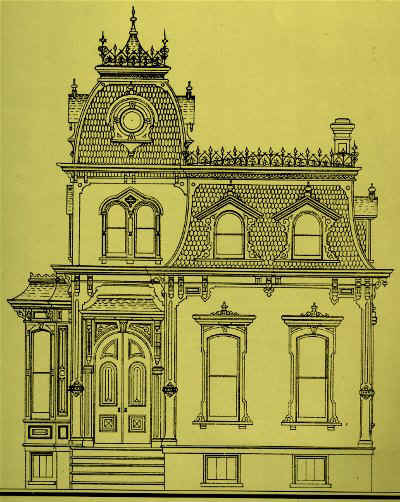 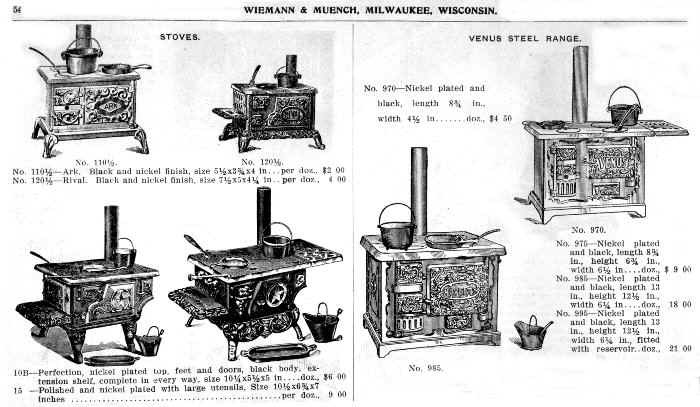 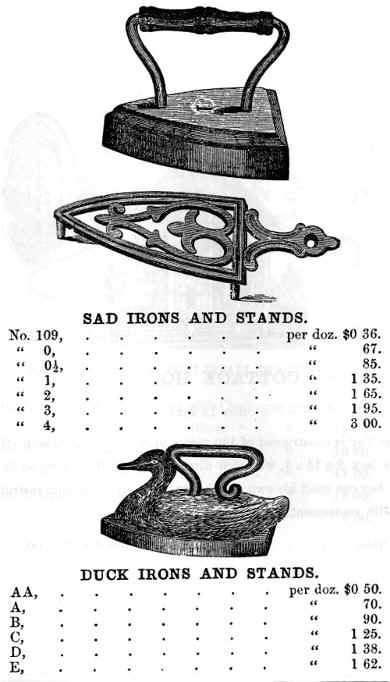 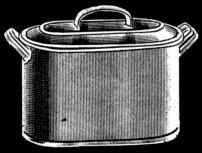 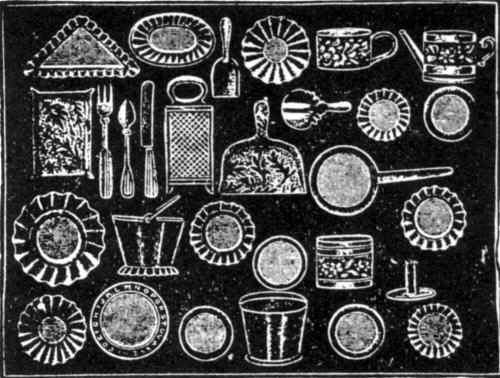 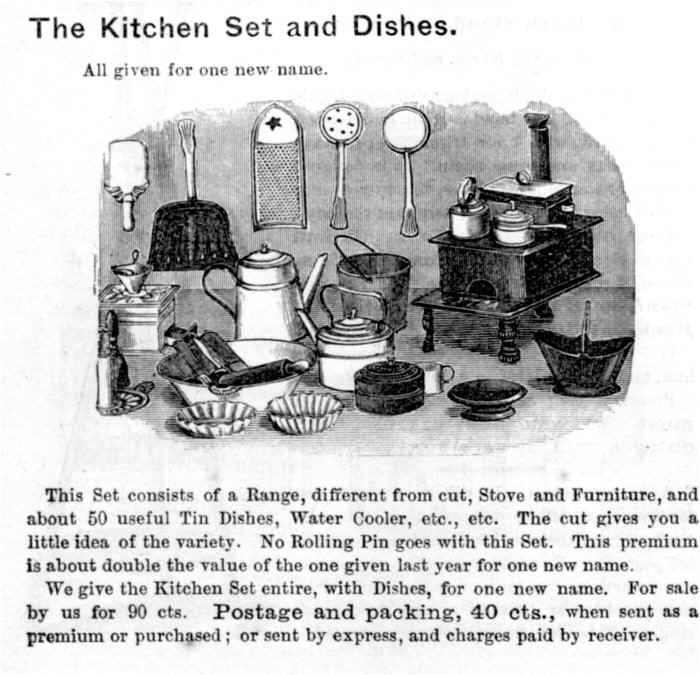 below 1905 Wiemann & Muench catalogue, Milwaukee, Wisconsin; coffee mill, coffee pot, kettle, etc. 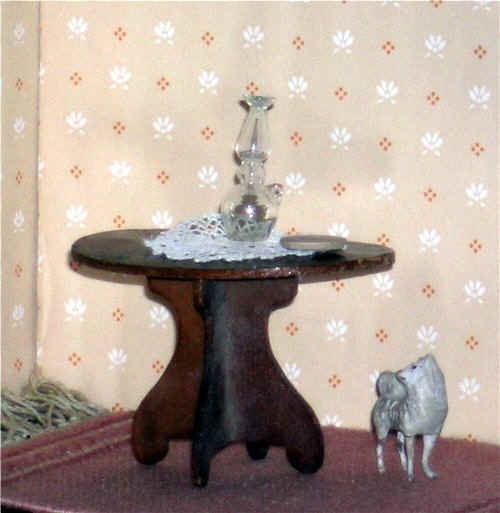 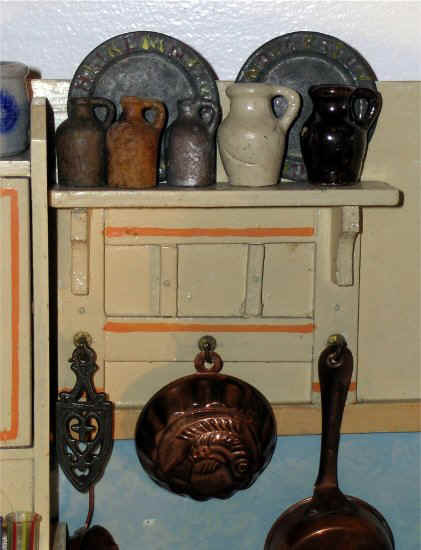 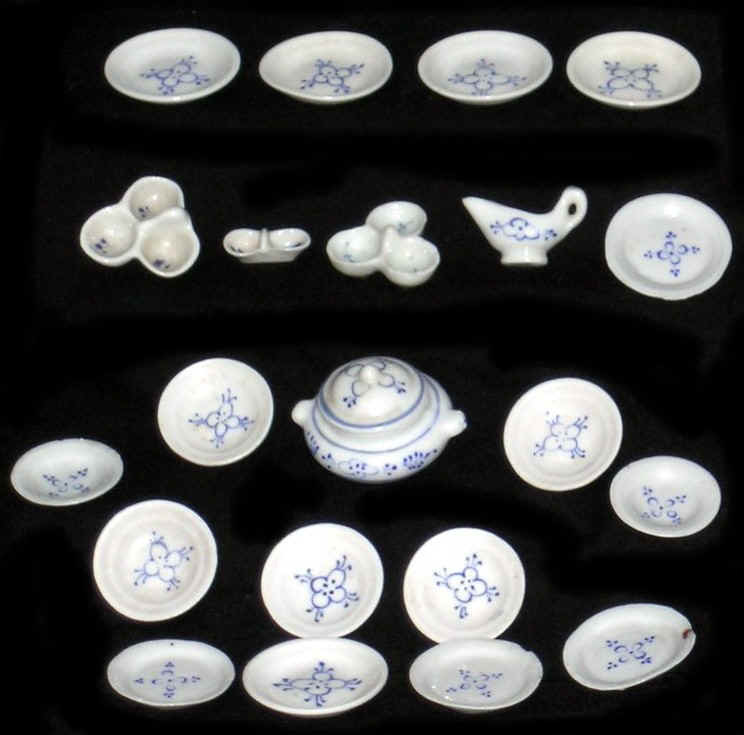 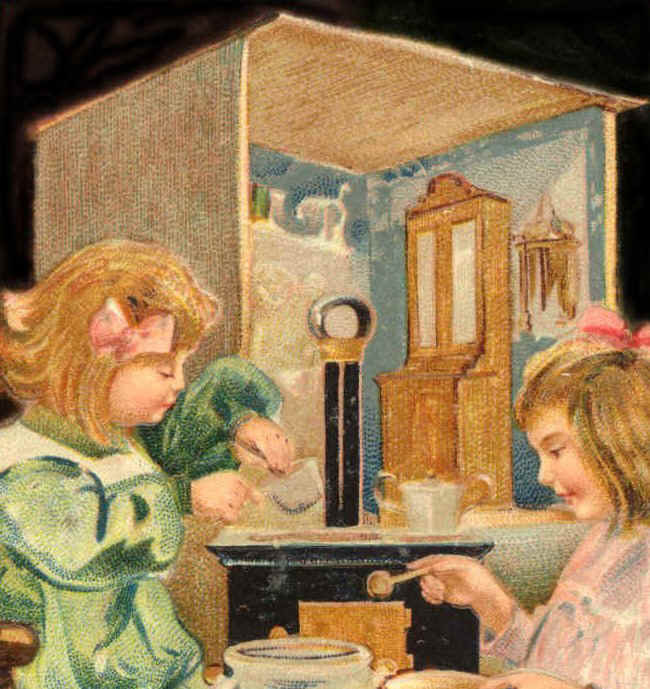 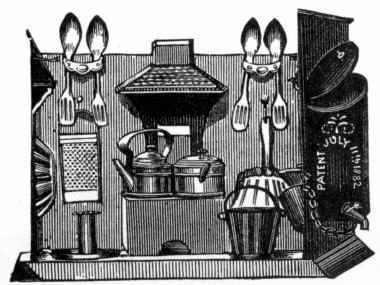 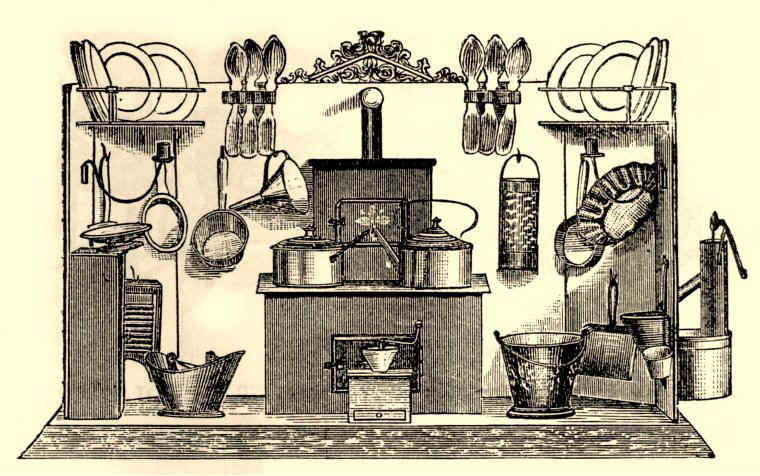 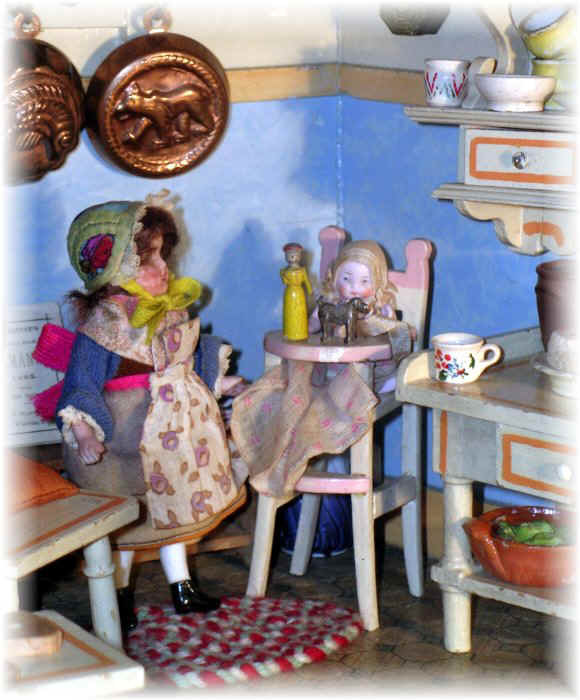 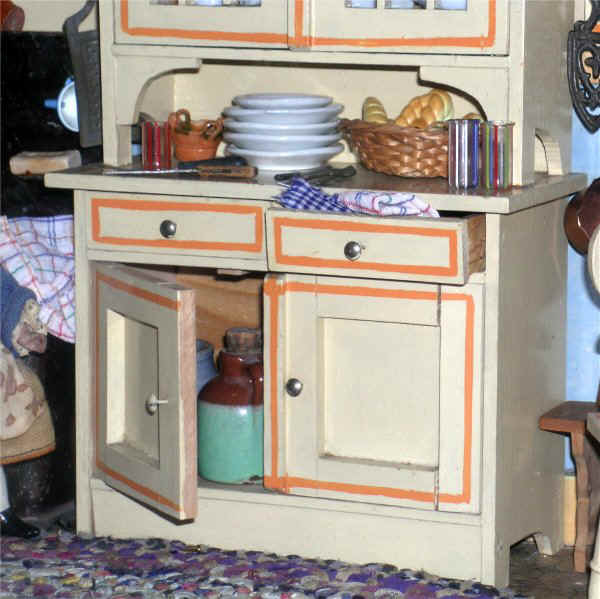 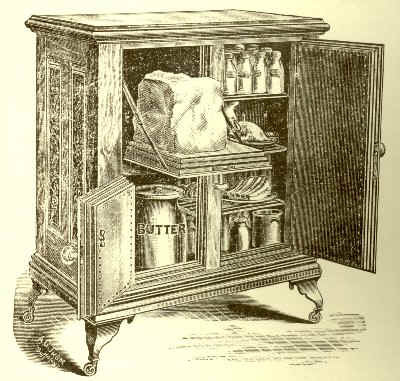 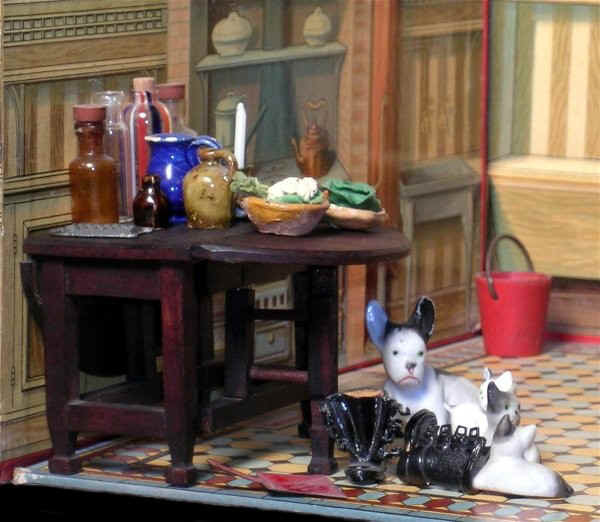 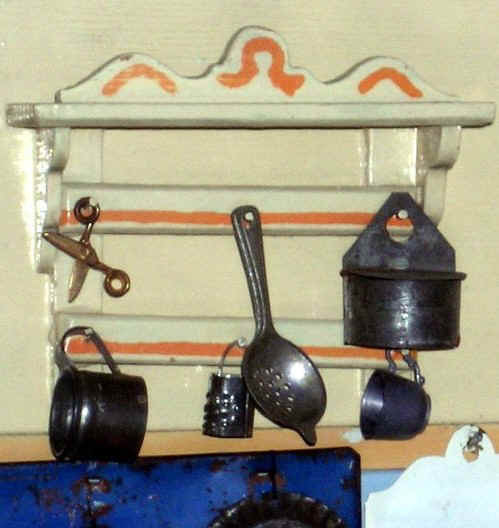 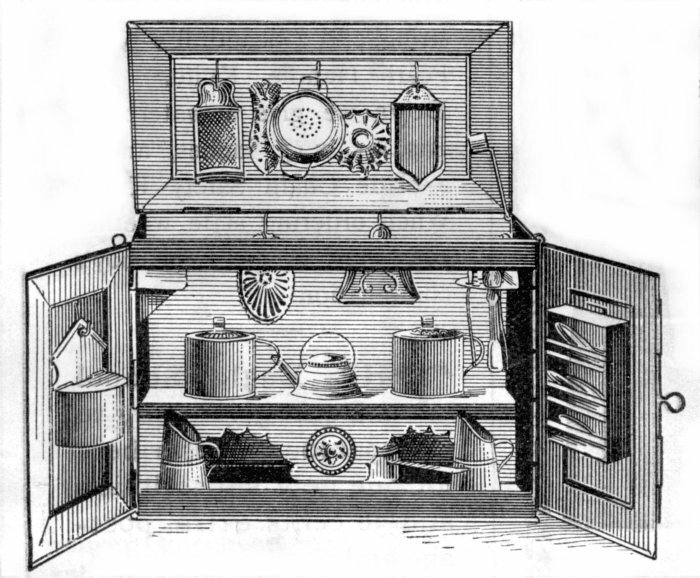 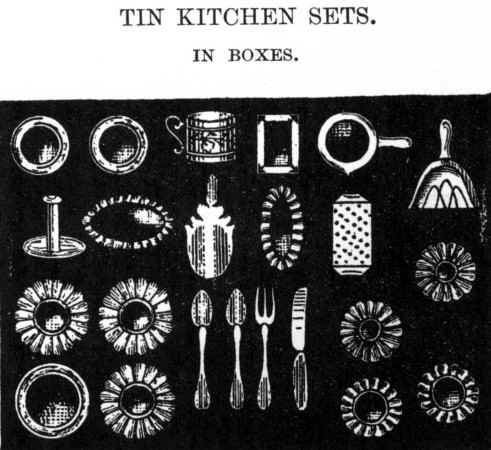 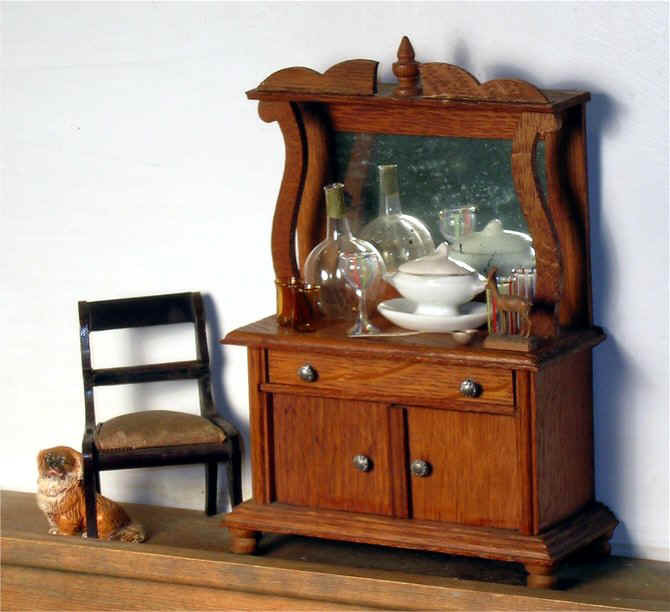 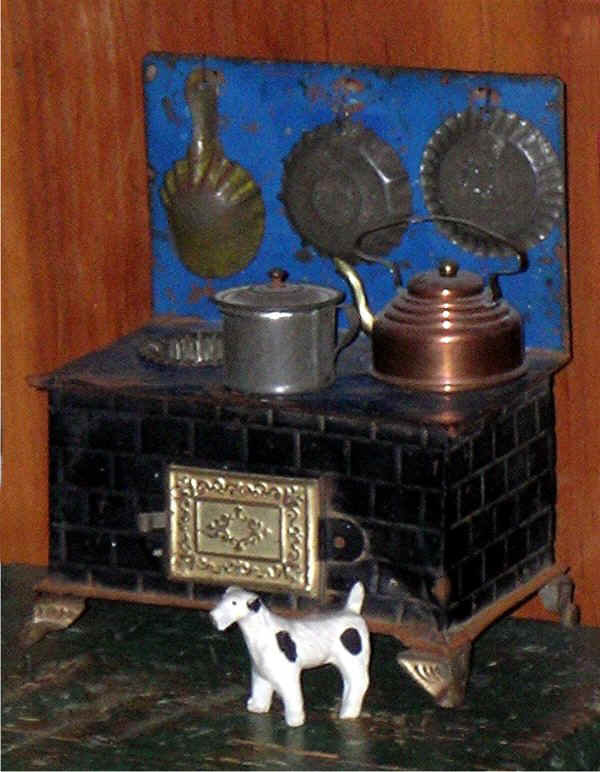 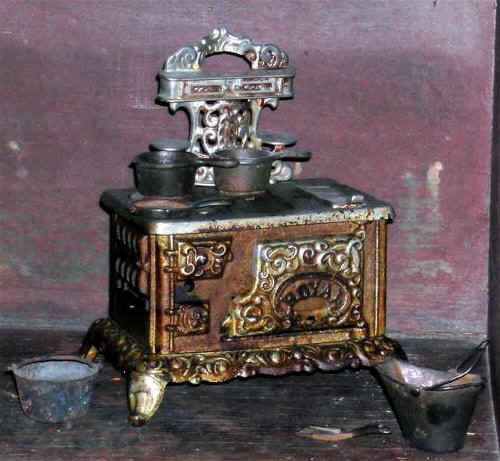 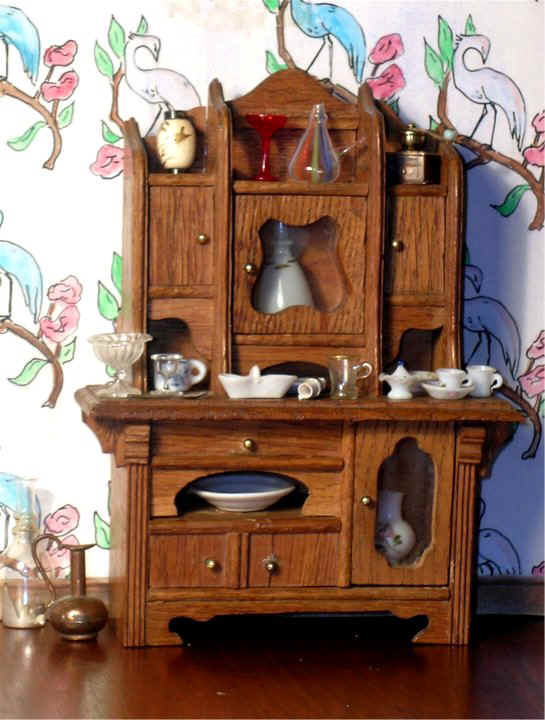 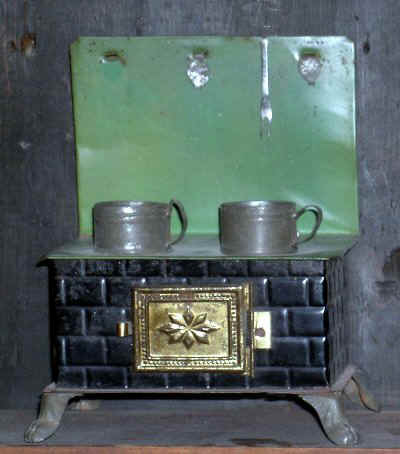 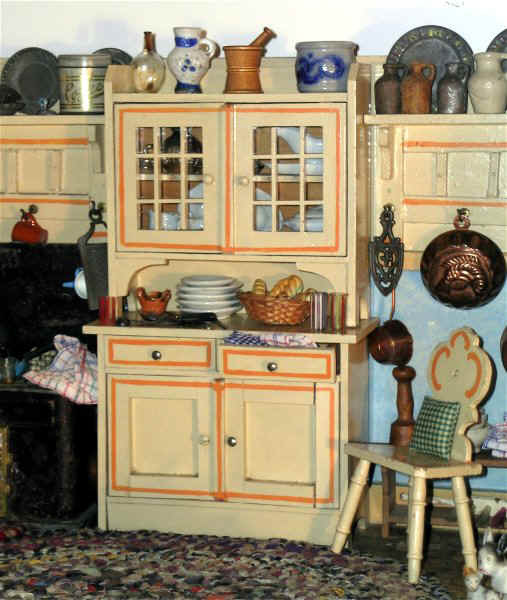 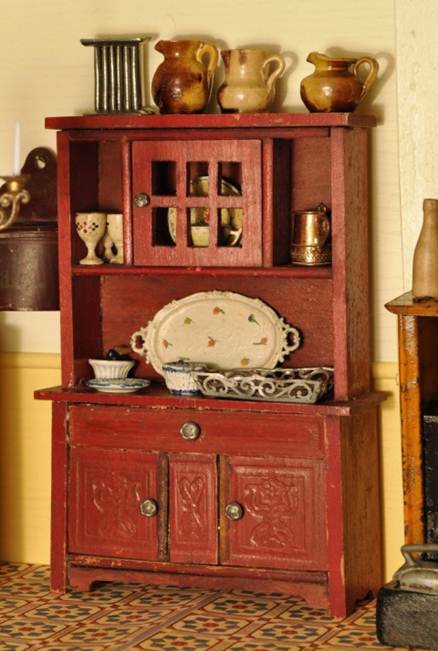 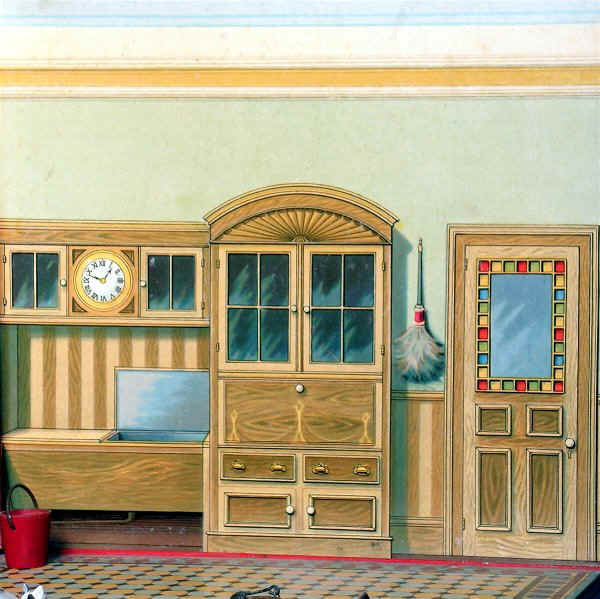 Late 19th and early 20th centuries tin kitchens, made in Germany, are descendants of much earlier toy kitchens, based on real European models. 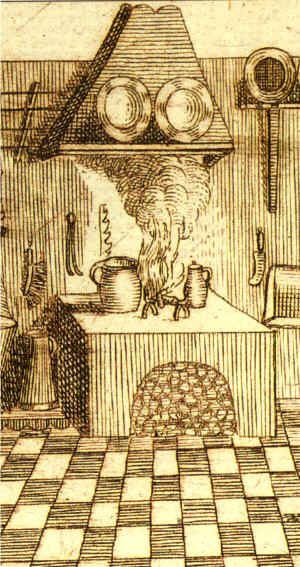 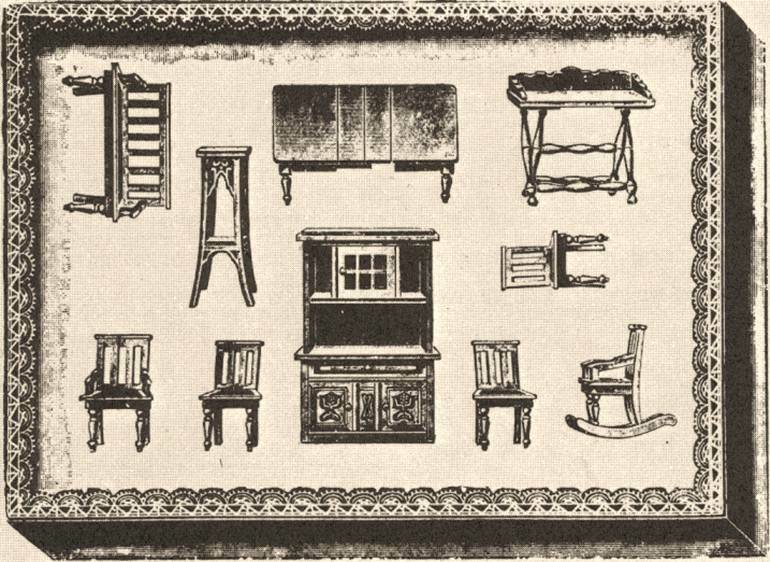 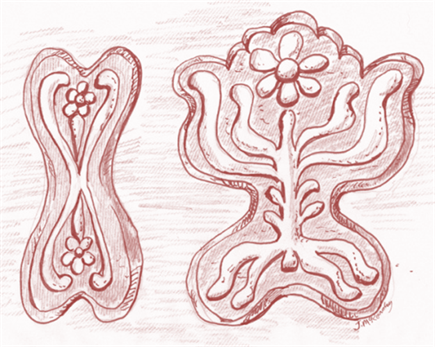 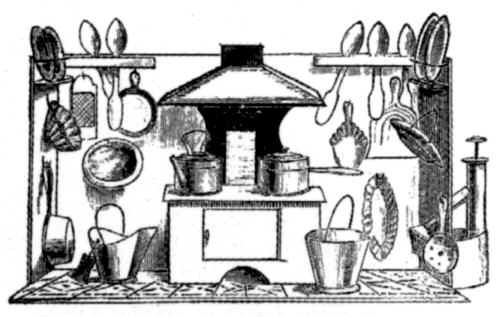 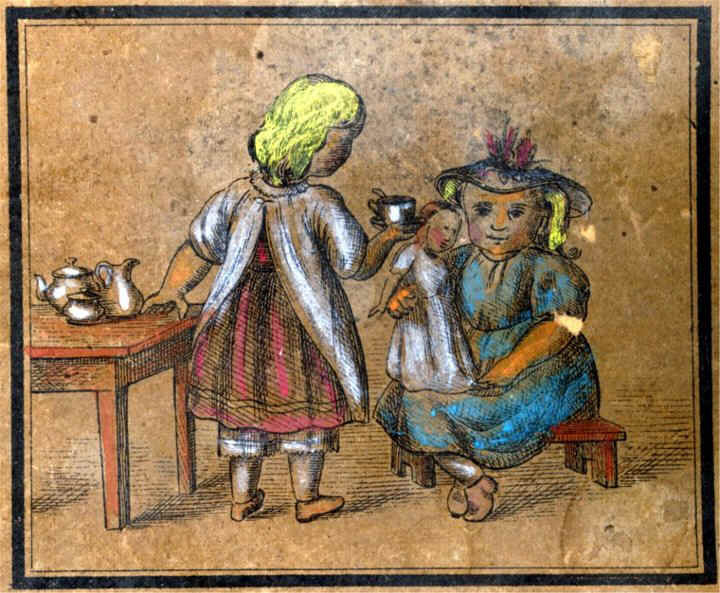 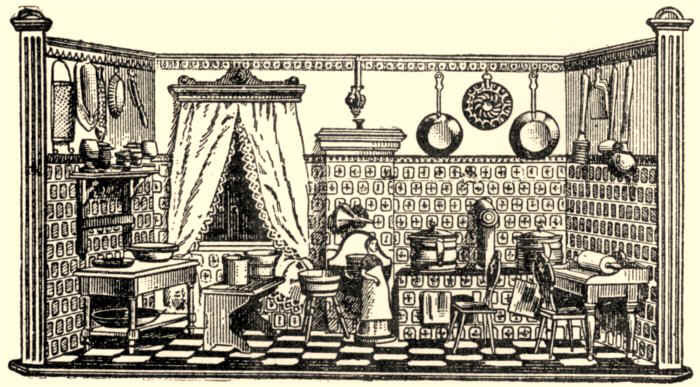 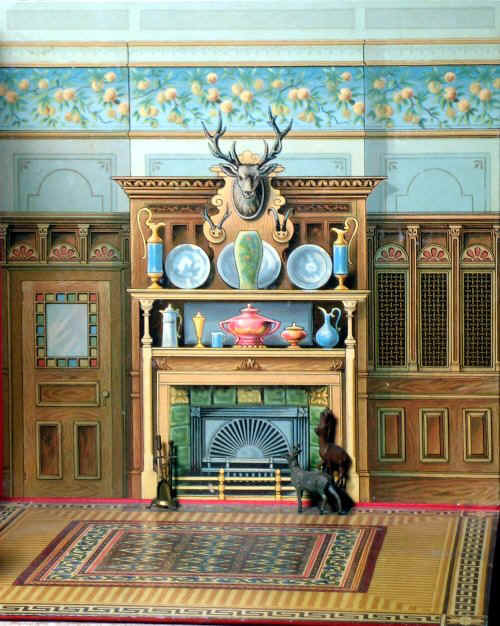 This detail of an early 19th century drawing (left) of a play kitchen demonstrates an open fire, burning charcoal, on the top of a tall hearth. 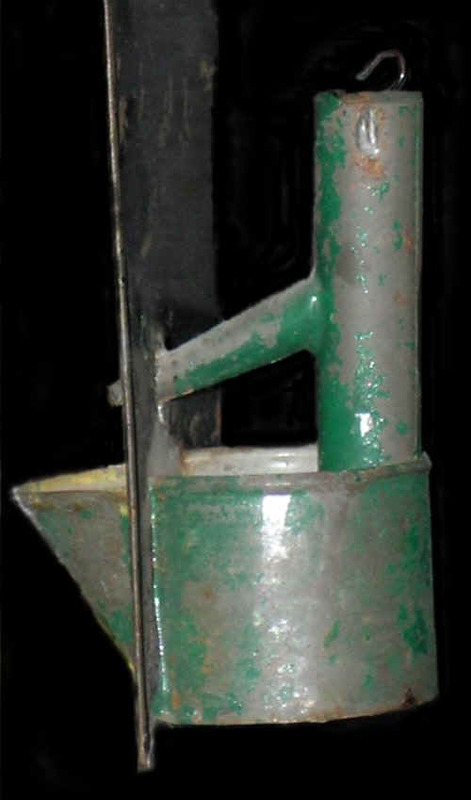 The latter has an arched opening for storing fuel. 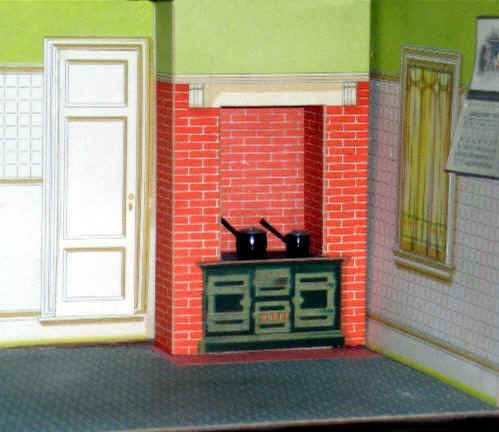 Smoke is drawn to the hood and chimney. 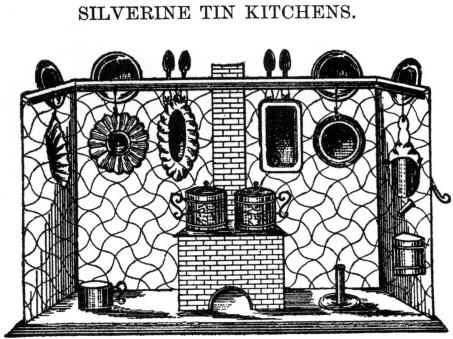 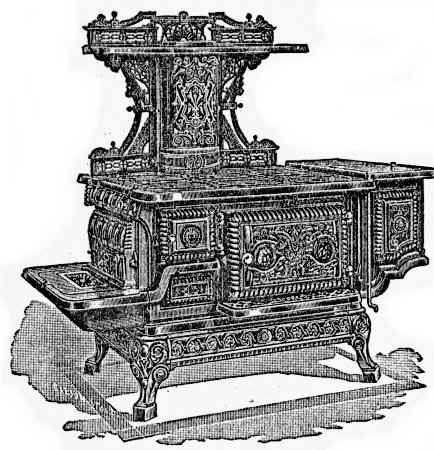 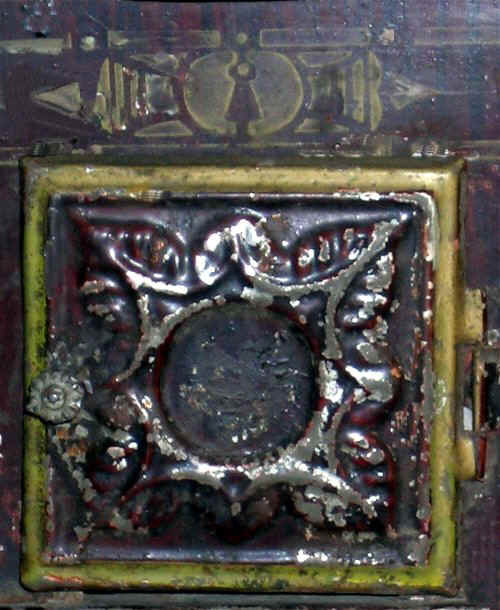 Most later tin kitchens have imitation-tile fire-boxes, burning coal, and containing an oven. 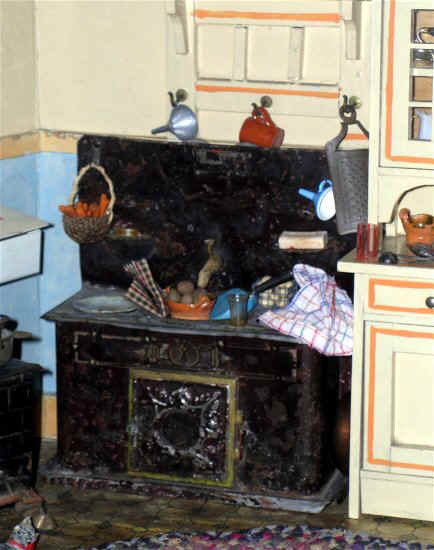 There are round openings on the stove top surface for heating pots and pans. 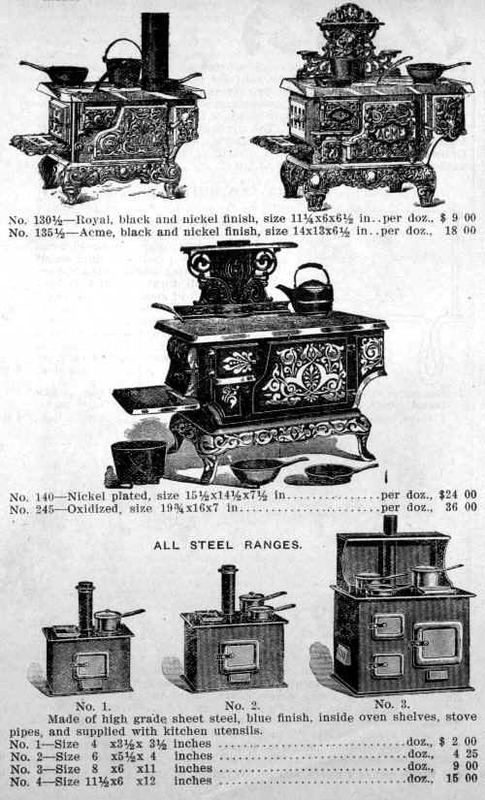 1872 Stevens & Brown catalogue, manufacturing company in Cromwell, Conn., USA; tin chimney and stove with two-tiered ovens in centre; pump on exterior side-wall with downward-angled pipe leading to a basin attached to the interior side-wall; accessories include plates, serving spoons, grater, coal scuttle, coffee mill, pail, ladle, pots, kettle, dust pan, funnel, scrub board, pair of wall candle-holders; eight sizes were available from 6" x 4½" to 19" x 12"
Painted china teaset marked "Made in Germany"
For readers interested in the products of the Gottschalk company, see Marianne Cieslik, Moritz Gottschalk 1892-1931, 2000. 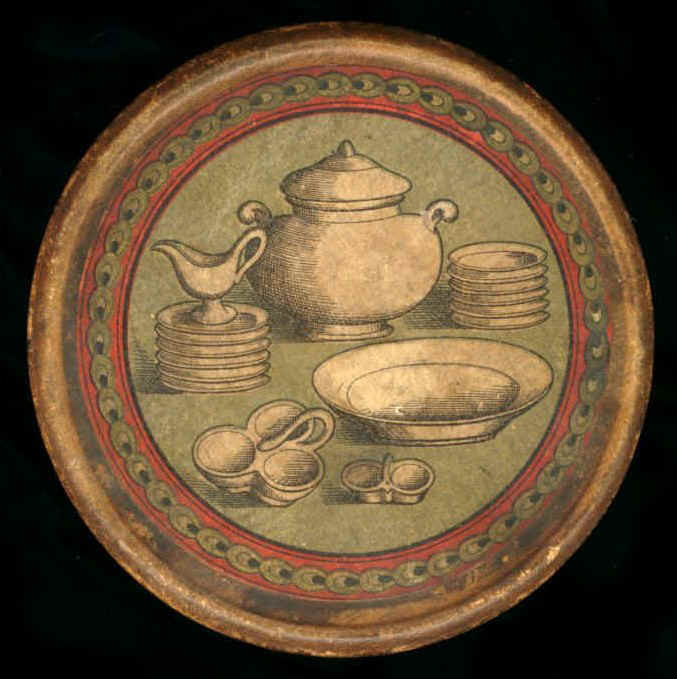 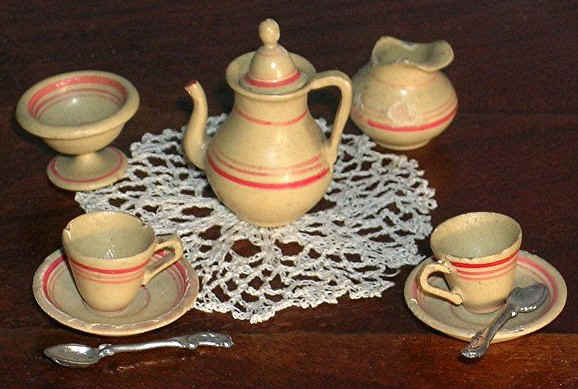 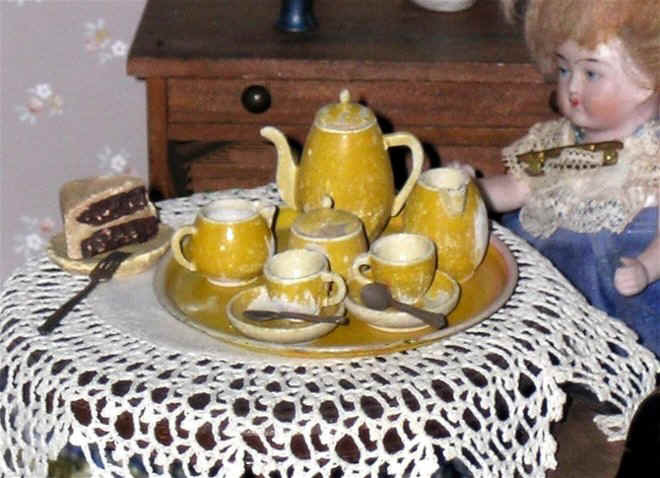 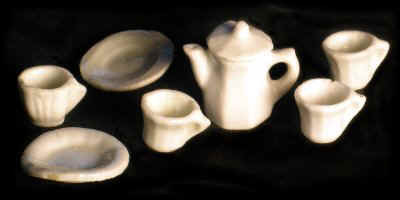 Treen teaset, c1910-c1930, painted a strong mustard colour and sitting on a matching tin round tray, stamped "Germany"; the piece of cake and set of cutlery came from the same American dollhouse. 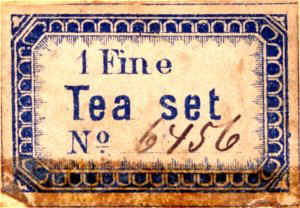 The teaspoons are just under 1". 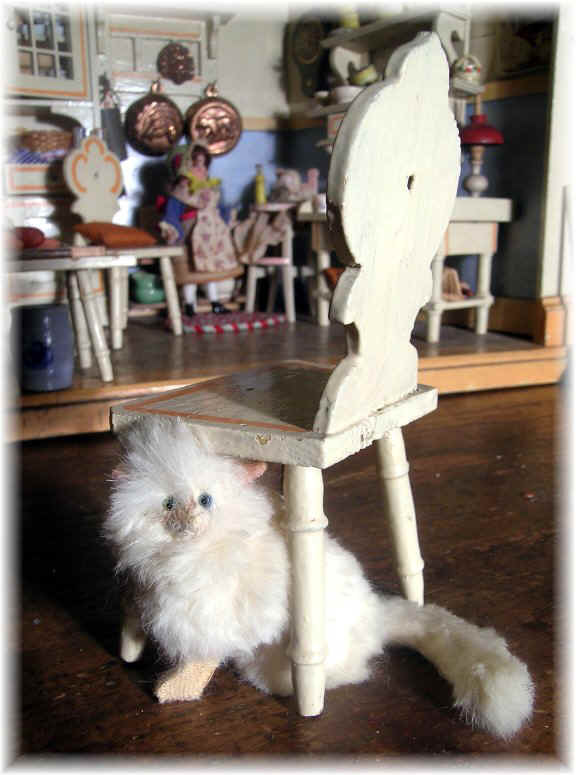 PLEASE CLICK HERE TO CONTINUE TO THE NEXT SECTION (ON PARLOURS)!